Very basic but does the job. You get what you pay for. It was clean and reasonably comfortable. Conveniently located close to shops and transport. Excellent value. Small room, but what was expected for the price. Extremely clean. Great location. Right near metro and bus station about a 10 min. walk. Free WiFi. Perfect for a one night stay. Day receptionist was very accommodating, warm and friendly. There’s a microwave facility if you wish to warm up your own food. Check in very smooth, staff person v polite and spoke English well. 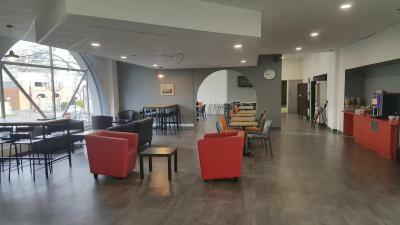 The hotel is extremely close to the enormous shopping mall with different restaurants, cafeterias, bakeries, big supermarket Auchan (so I think you can find there everything), and what is more important the train and the bus stations. There is a lovely park a few steps behind the hotel . Bed was very comfy. Breakfast great value for money. Unfortunately there is not too much positive to say about that room I stayed in..TV was working and wifi was good. well, it was my second time staying in the hotel and at my first stay of 3 night the cleaners did well but at my second stay of 31st December to 2nd January my room was let in mess no cleaning and I have reported it to the receptionist. unfortunately. 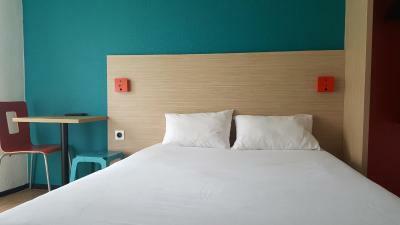 This modern Hotel F1 Cergy offers rooms with attached bathroom with flat-screen satellite TV and free WiFi access. The Hotel F1 Cergy is a 30-minute drive from central Paris via the A15 motorway, and 5 minutes from Cergy Prefecture RER Station. It is close to many facilities including supermarkets, the University and the Prefecture. A full buffet breakfast is served every morning and vending machines with snacks and cold and hot drinks are at your disposal 24/7. Daily newspapers are also provided. 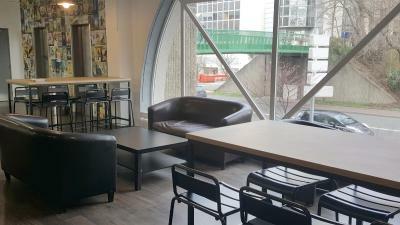 When would you like to stay at hotelF1 Cergy? House Rules hotelF1 Cergy takes special requests – add in the next step! hotelF1 Cergy accepts these cards and reserves the right to temporarily hold an amount prior to arrival. Breakfast is served from 6:30 to 10:00 during the week, and from 6:30 to 10:30 on the weekend and public holidays. Towels are not included, you can buy some for EUR 3 per towel. No towels provided. You have to pay €3 for each towel and they were small and very poor quality. I went to the local supermarket to get towels instead. It would be better if good towels were provided even if it meant the cost was a little extra. Also the flush on the toilet was very poor. The rooms were extremely small! The location was great. Everyday cleaning! Had to rent towels. No free coffee or tea. Hard mattresses. But seriously, for the price it was good. I had to buy towels and savon but the hotel did't accept credit card and other currency bur euro. Very bad and small rooms, pure service. No storage for luggage. Due to construction, lobbies and corridors dirty. Very small room. Can barely stand. The hotel room was not very nice looking. Bathroom was not perfectly clean. The building is relatively old and you can tell, even though some refurbishment has been done. Room was small and not as clean as I would have expected. 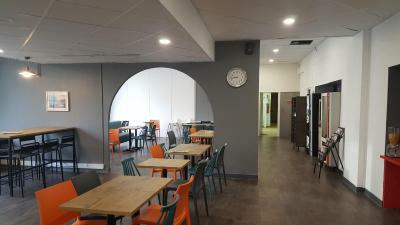 Location is great if you are going somewhere located in Cergy city centre or to the university. It will be nice if there were some bright pictures on the wall. The room smells like smoking room. There is no towel in the room, and after the night, my coworker got many incent bites. No parking near to supervise car or even unload. Lifted entrance not accessible until at re eption thereby making it useless for those sinlgle people with mobility problems . No choice of places to eat near hotel.